Today we continue the story of the fine binding of LABYRINTH SUBLIME and ANTARCTICA. Previously we described the hand-sewn book blocks and the hand-crafted leather covers. Now it’s time bring these together and complete some tomes. At Felton Bookbinding in Georgetown, Ontario, master binders Keith Felton (center), Chris Narayan (right), and Willie Albiez (left), are steadily progressing with the binding of LABYRINTH SUBLIME. Yes, you likely do notice that the photo below shows the men working on ANTARCTICA. 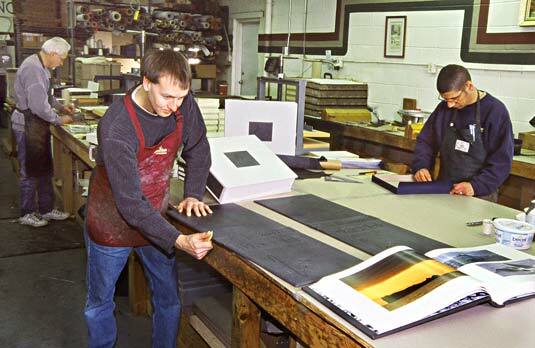 This is a photo we took a decade ago, the scene in the bindery being similar today, despite the passage of years. The majority of the photos illustrating this email were taken quite recently during the binding of LABYRINTH SUBLIME, courtesy of Felton, and a few were taken by us when ANTARCTICA was being bound. The binding developed by Keith when presented with the challenge of ANTARCTICA is actually a blend of two traditional bindings: The Classic European Leather Binding and The Split Board, Ledger Binding. Despite that binders around the globe considered the combination of these two styles to be technically incompatible, Keith obtained success following the making of several prototypes. The resulting hybrid binding is both elegant and strong. We have specified this special binding for LABYRINTH SUBLIME. The Classic European Leather Binding is aptly named, for it is considered to be classical. This is the binding of the Italian High Renaissance, as exemplified by the famous Aldines — fine books printed and bound in Venice, 1494 through to the late 1500s by Aldine Press, the leading publisher of that era. Among the notable features of this style are: a rounded spine; raised bands on the spine; leather joints (leather reinforcement of the flyleaves near the spine and crossing onto the inside of the covers); and doublures (a specific treatment of the inside of the covers, where the leather turn-ins from the exterior are evenly trimmed to form a window in which is placed an inlay of silk, marbled paper, contrasting leather, or as in our tomes, flocked velvet). Classic European bindings also have smooth, drawn-on covers with no French groove. The Split Board, Ledger Binding is also aptly named. Picture a scene from Charles Dickens A Christmas Carol with Ebenezer Scrooge’s clerk Bob Cratchit on a high stool at his desk, quill in hand, working on accounting records. Such ledger books and registries, even library books in centuries past, all used the historic Split Board, Ledger Binding because it was strong, durable, and could withstand much use. The secret is that the linen tapes woven to the spine of the book block during the sewing of the pages, were glued between splits in the cover boards. Short of purposeful damage, the pages could not separate from the cover. The practical French Groove had been invented in the late 1700s in answer to problems incurred in books bound with early split board methods — structural strength having created bulk which interfered with the ability to open the book. You’ll be familiar with the French Groove. It is the vertical indentation that you’ll see on almost all hardcover books today, running along the spine edge of the front and back covers, providing a thin flexible hinge. Perhaps because it was utilitarian, the French Groove was considered unfashionable among the binders of fine books in times past, and to a degree it still is. Certainly less skill was required to bind a book that opens easily when using a French Groove. LABYRINTH SUBLIME and ANTARCTICA share the stylish details of the Classic European Leather Binding, along with the rugged strength of the Split Board, Ledger Binding — and no French Groove. There have been no compromises. The skills and techniques used by our binders at Felton date to the 15th century. In similar fashion to the Aldines, the complex binding of our tomes is accomplished entirely by hand; and this is why ANTARCTICA and now LABYRINTH SUBLIME take so long to bind. 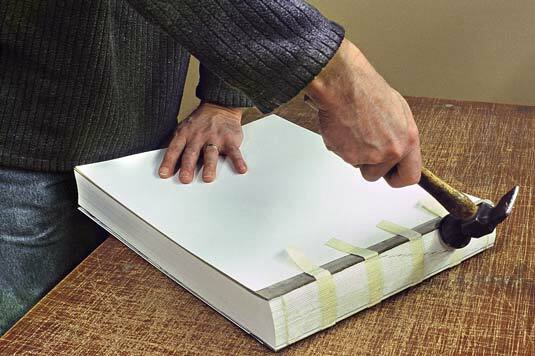 Below we share in pictures and words the binding of our tomes.... step-by-step. Should this detail be too great, please do browse the photos. 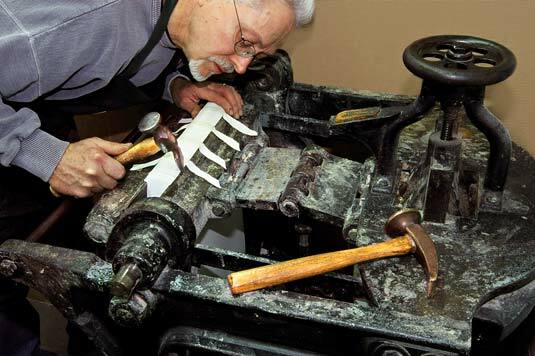 Keith Felton carefully rounds the spine of a sewn book-block using a bookbinder’s backing hammer. Note the four linen tapes, also the folded-over leather joint (the unseen half of which, glued to the flyleaf, has been skived so that its leading edge is thinned where the transition occurs to the velvet of the flyleaf). A protective white sheet has been temporarily tipped onto the flyleaf to keep the velvet clean and unblemished during the handling of the book block. Willie Albiez has clamped a rounded, book block in this massive backing machine. He expertly wields his hammer to “back” the spine forming “shoulders”. Here’s a closer view of Willie shaping the spine. He forms two L-shaped spaces, the shoulders in binder’s lingo, where later the cover boards will be flush fitted. This is the beginning of the special attention needed in preparation for a smooth cover with no French Groove. Soon after rounding and backing, the spine receives head-and-tail bands. Made of silk thread colour co-ordinated with the leather, these decorative touches complete the top and bottom edge of the spine. A linen lining, adding further strength, is glued to the spine. Next is the hollow, a tube made from multiple layers of strong paper, black in colour, with all layers save one in the middle bonded together. 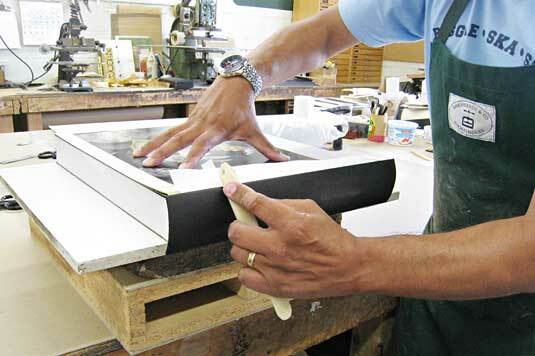 In this photo Chris applies the hollow to the spine of the book block. The tool in his hand is a bone folder, actually made of bone. You can see one of the green-and-white-striped head-and-tail bands in position and, over top the protective sheet, the linen lining and the four tapes. ANTARCTICA and LABYRINTH SUBLIME are both “hollow back” as differentiated from “tight-back.” That is to say, when a finished book is opened, the hollow lifts allowing the pages to lie somewhat flat which is physically impossible with the tight-back style. Through the design and construction of the hollow (with half its layers adhered to the book block and half to the leather spine), the binder predetermines the height of this lift, thereby controlling the actual degree to which pages can lie flat while avoiding undue stress on the stitches. In the photo below, the hollow is the black tube being glued onto the book bock spine. Chris is pressing the glue to the edge of the hollow using his bone folder. When you open our tomes, once the binding relaxes somewhat, you’ll see the raised triangular space formed by the “hollow” at the top and bottom of the spine. In the last missive we described the making of the covers of LABYRINTH SUBLIME, also how the leather is embossed. Now we show you the unfinished interior. You’ll see the leather “turn-ins” along the margins; the spine area with its beige, thinner board; and the front and back covers with thick, whitish boards. 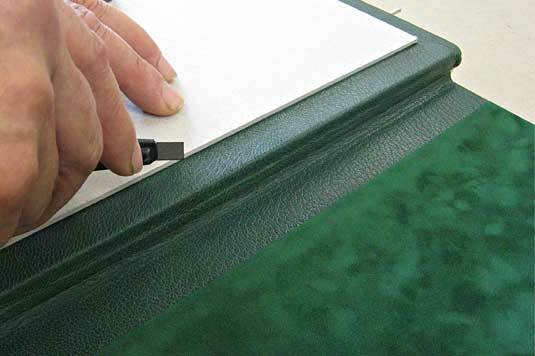 Apropos to the Split Board, Ledger Binding, our master binders split the boards, of both the front and back covers, between layers that together make up the 1/4" thickness of the covers. This split is about 3" deep and extends the width of board between the leather turn-ins. The diagonal pencil lines which you’ll see on the boards below are guides for precise mitring of corners of the extension of the leather joints to be positioned on the cover boards in a later step. The linen tapes are positioned with the bone folder into the split. For demonstration purposes, we staged this photo. In reality there would be archival glue and a linen lining involved. In oblique-angle photo below you can see four linen tapes and a linen lining glued to the lower board. More adhesive is used to seal the split and bond the boards solidly together. At this stage the book is put in a press under pressure until the glue sets. 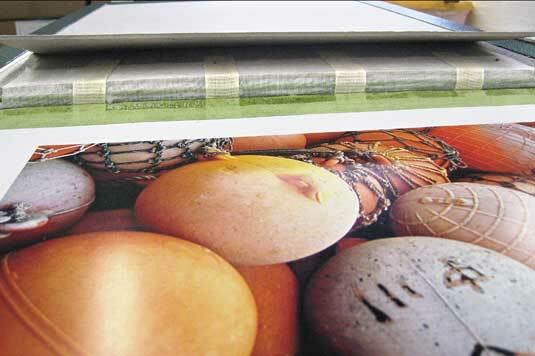 In this manner the linen tapes and lining are permanently sandwiched between the laminations making up the cover boards. The support of the heavy weight of the pages is thus transferred via the linen tapes (which are integral to the sewing having been woven securely into place) and lining to the covers. This is the strength of the Split Board Ledger Binding. We can take one of our tomes by its cover, at nearly 20 pounds of weight, and shake it like a rag. The pages will not fall out, the binding does not fail. Mind you, should the book be dropped, as Pat has done by accident, it can damage your toes, as he found out to his sorrow. 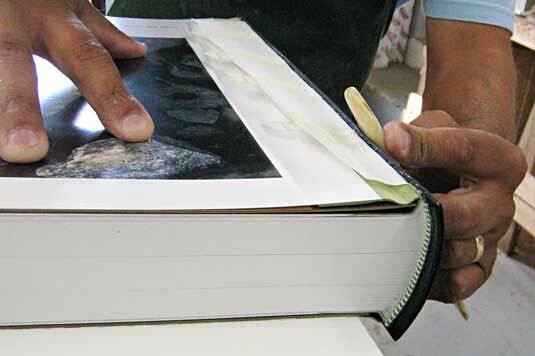 This technique of hand-binding is ever so different then modern, machine binding where a lining glued to spine of the book block (no sewn tapes) is pasted over top (not within) the cover board. Such a binding would never hope to hold a book anywhere near the weight of LABYRINTH SUBLIME. 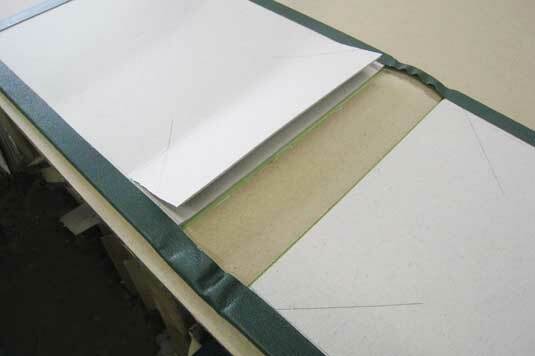 Previously, the binders prepared the two leather joints required for each book. A special hand-powered tool fitted with an extremely sharp blade skives the underside, thinning the edge. The colourful page of buoys above are a temporary, protective sheet shielding the velvet flyleaf from damage during the binding process. The pale green stripe is actually the underside of the leather joint, the unseen half of which affixed to the flyleaf, adding beauty and strength at the flex point. The visible half will be flipped over and positioned grain-side up atop the adjacent cover board (once the split is permanently closed), with mitred corners to become the fourth edge of the doublure. The doublure is the leather window on the inside of the covers within our binders place an inlay of French-flocked velvet. Finally, nearly eight months after printing began, the first copies of LABYRINTH SUBLIME have just a few more steps to go. Here several are stacked, under weight, with inserted protective card to even the pressure between the velvet flyleaves and the incomplete covers so as to prevent the leather turn-ins from embossing the velvet flyleaves. 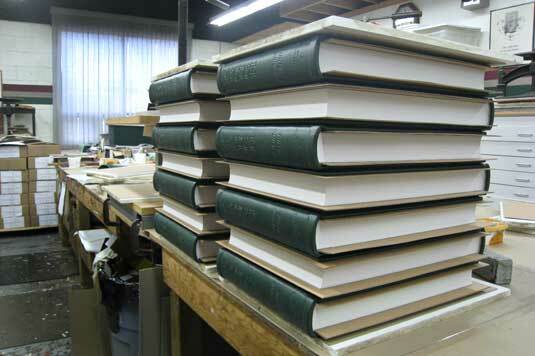 Finishing the doublure is the final step in the lengthy hand-binding of our tomes. Here again is where the skill of the binder is clearly evident. Using a weighted template and knife, Willie trims the four leather turn-ins to a consistent 3/4" width. 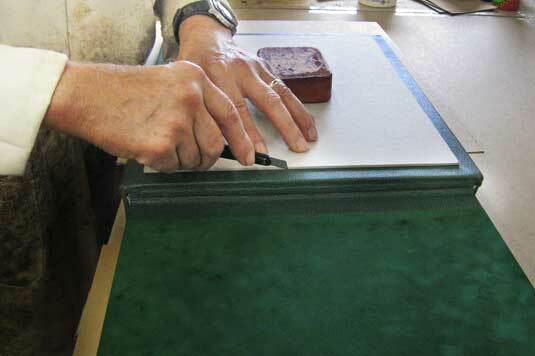 To the right of his hands you can see the finished velvet flyleaf with its leather joint. A closer view of the trimming operation. Not one slip or all is lost! 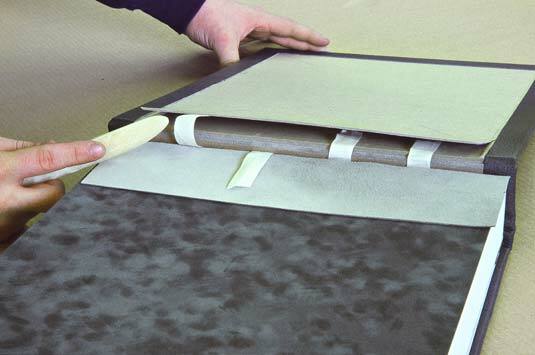 Once the leather turn-ins are trimmed, an inlay of velvet is placed in the window opening. This is exacting work as the height of the velvet nap must be exactly the same height as the leather, despite that these materials have different thicknesses. Also, there can be no gaps between the edges of the velvet and those of the leather — precise measurement and cutting is critical. 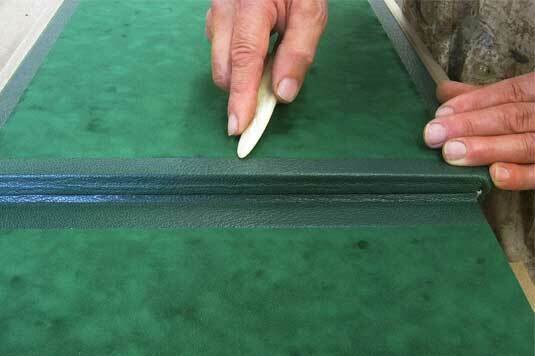 The inlaid velvet abuts the cut edges of the leather. It does not overlay, thus nothing is hidden. This is an important distinction from 99.9% of hardcover books where a decorative paper will overlap the edges of the covering cloth or paper on the inside covers. In such books there is also no attempt to eliminate the bump where these materials overlap. For our tomes, perfection is essential, as is a very steady hand and sharp eye. 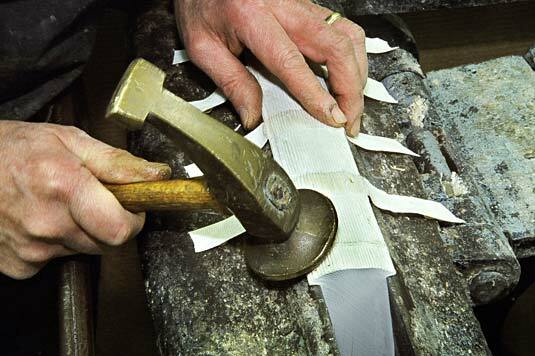 Willie uses a bone folder to smooth the velvet into place along the leather edge. We close this email with good news and a but. We’re delighted to share with you news that Felton Bookbinding has completed the binding of the first 40 copies of LABYRINTH SUBLIME — tomes for all Subscribers! We’re quite delighted! Congratulations and our heart-felt appreciation to Keith, Willie, Chris, Jacqueline and Joan!!! Only another 250 to go to complete the task at hand! We certainly do need a photo that expresses euphoria at Feltons, and this we will take ourselves and share with you when we visit the bindery in late October. For today, we do hope that this concluding description of the dedicated efforts at Felton has given you some knowledge and appreciation for the skills and techniques of the fine binding of our tomes. And now for the but.... we’re not quite ready to celebrate. At Friesens Specialty Packaging the production of the accompanying linen presentation boxes has fallen behind schedule as Friesens continue to apply their energies to producing a prototype that meets our specifications — to be as finely made and at least as strong, or if possible stronger, than our ANTARCTICA presentation boxes. A further prototype, hopefully the final, is being made as we write. Once we have given approval to proceed, we can anticipate receiving 20 to 30 presentation boxes per month. Release of our tomes awaits the completion of these presentation boxes. We’re all doing our best.